There is a strong case for devolution to counties both in terms of their significant role in relation to economic growth and public service reform, and in terms of the patchwork approach to democratic reform that is taking place across the UK. It is clear that there is a real opportunity for non-metropolitan areas to bid for increased powers to boost their economies and better serve their populations. The government is right to insist that there is no one-size-fits-all approach to devolution dealmaking. The complex governance of counties makes this all the more relevant, but in the absence of any published guidance or due process, counties too often perceive they are faced with a set of unwritten rules. Following the general election in May 2015, the government has pushed forward an unprecedented wave of devolution in England. With the open-ended Cities and Local Government Devolution Bill at the centre of its new approach, the government has consciously avoided detailing any form of guidance as to how devolution will proceed – its argument is that local areas need to work together to bring forward their own proposals for devolution and then to negotiate a ‘deal’ with central government. In principle, there is much to be said for this approach. In practice, progress has been far from straightforward, not least for England’s counties. There is a strong case to be made for devolving to England’s county areas. Counties cover 86 per cent of the landmass of England and represent half of the country’s population, and collectively they represent a sizeable proportion of the national economy.1 However, county economies face significant challenges: not least low productivity, relatively low wages, high levels of benefit claimants on ESA among those on out of work benefits and large levels of skills mismatches. Devolving significant new powers for economic development should help counties to address these issues and boost the national economy. Beyond their economic potential, counties also have huge opportunities for public service reform, delivering more efficient services and better value for money. With significantly higher proportions of older people than is the case in cities, counties are facing bigger health and social care challenges than other parts of the country and costs of service delivery that are much greater in more isolated and rural parts. For both of these reasons, counties need devolution deals just as much as cities. But their situations tend to be more complex. For a start, counties are more geographically diverse, often incorporating urban, rural and coastal areas and sometimes covering quite distinctive local identities too. Counties very often involve two-tier governance with county councils and district councils responsible for different functions, as well as single-tier unitary authorities. Unlike city-regions, counties require both horizontal and vertical joint-working and integration. In this report we highlight five different case study county devolution proposals, each of which demonstrates the importance of adopting a locally specific range of powers that local authorities would like to see devolved, alongside the changes to local governance that the county is prepared to adopt in order to draw down the new powers on offer. The negotiation process for many counties has highlighted significant areas that could be improved. First, despite the rhetoric around locally tailored deals, it has become increasingly clear that the government does have some unwritten rules, particularly around scale and governance. County proposals that have been considered too small have been challenged, while, more significantly, in almost all cases where there is anything other than modest ambition, the government would appear to be insisting on the introduction of a directly elected mayor. Although there is a clear commitment to developing more effective and streamlined local decision-making, the conditions under which directly elected mayors might work well do not always exist at county level. Second, there is significant variation in the approach taken by different government departments towards proposals put forward by county areas. Although county stakeholders have been very positive about the Cities and Local Growth Unit and its role in facilitating devolution negotiations, a number of government departments seem to require intensive bilateral negotiations and – at the end of the day – the Treasury would appear to hold the whip hand. None of this is made any easier by the fact that the government itself was unprepared for the sheer number of devolution proposals and the capacity issues this would throw up. Finally, the lack of any guidance at all has brought to the surface a number of more fundamental tensions about the real purpose of the government’s strategy. The original orientation of the approach was towards economic development and yet the permissive nature of the bill, together with the devolution of health and social care to Greater Manchester, has opened up a significant new front in relation to public service reform which is of particular interest to counties. In many respects economic development and public service reform are two sides of the same coin, but outside of cities they can have quite different implications for the scale and nature of proposed governance arrangements. There are further tensions between scale and local identity. The government’s enthusiasm for bigger geographies – and those coterminous with local enterprise partnerships – may be logical in terms of strategic planning, but in some situations it makes little sense when considering the adoption of a directly elected mayor or a single combined authority. And in all of these deliberations, the democratic dimensions of devolution seem to be secondary to the expediency of getting a quick deal done. In truth, there is a significant risk that unless there is greater public deliberation, more business involvement, and greater clarity of process, many people will treat English devolution as a cynical transfer of powers between national and local political elites. So how do we move forward with a process of devolution that can resolve some of these problems? It is vitally important that the bottom-up approach to devolution is not lost, nor that the importance of locally specific devolution deals is undermined – but diversity of outcome should not be confused with a disregard for due process. Many counties now feel that they face a set of unwritten rules in developing their proposals. To this extent there needs to be greater clarity. To this end, we return to our principles of decentralisation set out in a previous report2 and propose some more detailed suggestions pertaining to the immediate context and to county devolution in particular. Recommendation 1: The primary narrative of county devolution deals should be to drive economic development, and in the short-term deliver the government’s agenda associated with local growth. Public sector reform, particularly health and social care integration, should remain a central pillar of county devolution deals. However, it should be acknowledged that in most cases this will be dealt with over a longer time period once initial arrangements start to bed in and governance capacities grow. Recommendation 2: Where county devolution deals are economic in nature, they should be coterminous with LEP boundaries – but the government should make it possible to allow for the rationalisation of LEP boundaries where there is local demand to do so. Recommendation 3: The role and remit of local enterprise partnerships should be reviewed and clarified by the government within three months of the Cities and Local Government Devolution Bill becoming law. It is increasingly clear that the government is closely wedded to the idea of directly elected mayors for anything other than very modest devolutionary proposals.3 It also seems to prefer large-scale combined authorities, coterminous with LEP areas. There is a clear contradiction in this position, especially given the demonstrable complexity associated with county devolution arrangements and the creativity with which local partners have approached new governance solutions. However, while counties are working with partners to develop robust governance models, they may need to recognise that significantly increasing local powers are necessarily conditional upon higher levels of visibility and accountability of decision-makers – maintaining the status quo is not an option. Recommendation 4: The government must demonstrate by its practice that it is genuinely committed to a range of different models of governance and that it is genuinely responsive to the creative solutions being developed in counties. There should be a presumption that ‘form follows function’. Recommendation 5: The government should allow for more than one combined authority to work together to strike a devolution deal where the local circumstances make it advantageous to do so and where satisfactory arrangements are in place for joint-working and decision-making. Recommendation 6: The government must clarify the powers and functions that it is prepared to devolve to all local areas as part of the spending review and reforms to business rates retention. The development of more bespoke and ambitious deals should continue alongside a core settlement. Recommendation 7: The government must accept (or deny) that the directly elected mayor model of governance, which may be highly relevant in more monocentric city-regions, might not be the best model of governance for counties and therefore demonstrate genuine openness to alternative models. • there is a clear public demand for greater visible leadership. • where a directly elected mayor will add further complexity in an already complicated system of governance. Recommendation 8: Equally, counties must accept that with additional powers over significant functions and funds, new governance arrangements must allow not only for more sophisticated decision-making processes but ALSO for higher levels of public visibility and accountability and provide arrangements for doing so. Recommendation 9: The government needs to streamline its capacity to negotiate devolution deals, deploying cross-departmental teams dedicated to specific deals with the authority to coordinate government decision-making and reduce the amount of bilateral negotiation between proposers and individual government departments. Recommendation 10: The government needs to clarify its process for deal negotiation and sign-off. Recommendation 11: The government should provide a clear and unambiguous statement that bespoke devolution deals will be negotiated with all those county areas who seek them over the duration of this parliament. Recommendation 12: The government should clarify a series of milestones for the future negotiation of deals according to the ‘type’ of deal being discussed, with some form of timetable for each of the 38 areas already under negotiation as well as opportunities for new proposal to be brought forward. Recommendation 13: The government should do more to negotiate neighbouring deals rather than prioritise city devolution deals over county negotiations. Recommendation 14: The government should work with other national bodies to do more to encourage collaboration between neighbouring areas in order to enhance deals and drive up good practice. a unitary model – as in the case of Cornwall – where district and county tiers are combined. Recommendation 15: The broad headlines – if not the precise details – of devolution proposals could be shared more widely, even if not with the public, in order to allow for local authorities to link up with areas where there might be some learning and synergy though joint-working. Recommendation 16: Building on existing good practice, there should be more opportunities for local authorities with similar proposals to meet and network together under the auspices of bodies like the County Councils Network and other local government umbrella bodies through secondment opportunities and more specific support programmes, for example. Recommendation 17: More training and support should be offered to local councillors who often feel marginalised by current processes. This needs to be developed locally but could be supported again by umbrella bodies for local government. Recommendation 18: There should be greater engagement between local authorities and their local members of parliament in understanding and supporting local proposals in county areas. In the past few months, the devolution genie has well and truly escaped the lamp. This presents a huge opportunity for cities and counties alike, but unless the government moves quickly to recognise the importance of county devolution – and the added complexities that this brings – and unless it demonstrates a greater willingness to adhere to its principle of negotiating locally specific deals, then it risks causing little more than irritation and dissent. With some simple steps to clarify its purpose and principles and to spell out a more coherent process for negotiation, the government could quite easily set the process back on track. If it does not address these issues, its well-intentioned plans could be undermined by frustration and lack of trust. 1 Counties represent two-fifths of the national economy; they have more active businesses than any other part of England; business start-up rates in counties are second only to rates in London; and counties such as Surrey, Oxfordshire, and Cheshire and Warrington have growth rates that surpass any of the Core Cities (CCN 2015b). 2 In Decentralisation decade (Cox et al 2014) we identified five principles which we argued should underpin any programme of decentralisation in England: (1) Decentralisation must be for a broad and clear purpose – with some clear, long-term goals and outcomes; (2) Decentralisation must be joined up requiring a coherent and coordinated approach across government; (3) Decentralisation will necessarily be asymmetrical as the appetite and capacity for devolution will vary from place to place and the arrangements themselves will vary according to local context; (4) Decentralisation will take time, not least for the necessary adaptations to take place – both centrally and locally – and for new capacities and skills to develop; (5) Decentralisation requires cross-party support. 3 That Cornwall managed to sign a significant deal is partly testament to their foresight and preparedness, but other areas that lack the simplicity of a unitary structure and a relatively straightforward local geography are highly unlikely to achieve something similar – as many stakeholders have stressed to us, Cornwall was a unique case for devolution. England’s decentralisation decade has begun apace. Following concerted pressure on national politicians to rethink the way that power is distributed across the country, the new parliament has seen a renewed enthusiasm in central government for ‘a revolution in the way we govern England’ (HM Treasury 2015a). During the 2015 Queen’s speech, the Conservative government introduced the cities and local government bill, which allows for the transfer of wide-ranging powers from Whitehall to local areas. In effect, the legislation is an ‘enabling bill’ (Sandford 2015), that is to say that it does not specify the devolution of specific powers to individual areas but instead creates a legislative framework which will enable orders for powers to be transferred to combined authorities, local authorities and public sector partnerships when agreed through individual devolution deals. The scope of the bill has expanded as it has been developed. The initial focus of the policy was firmly on cities and urban areas. However, following concerns that two-tier and rural areas of England should be included in any proposals for devolution (DCN and CCN 2015), the government has since indicated that ‘city’ and ‘county’ bids for devolved powers will be treated equally (Paine 2015a). In addition, a Lords amendment to the bill has been added to commit parliament to provide regular and comprehensive updates on the progress of local devolution, with the explicit intention of measuring ‘how devolution was working for different types of authorities – the counties as well as the metro cities [… and] how devolution was shaping up in rural and coastal areas, whether all relevant authorities had been able to take advantage of similar functions’ (HoL 2015). This has kickstarted a process of devolution proposals from local areas across the country, who were invited to submit proposals on their ‘asks’ (that is, what they want from central government) and their ‘offer’ (that is, what they will change about the way they work in order to improve their local area), with an incredibly tight deadline of 4 September 2015 ahead of the comprehensive spending review. So far, much of the process has been characterised by a lack of top-down guidance, and the onus has been placed upon local areas to bring forward their own proposals for devolution. There is much to be said for this, not least the importance of bespoke deals, because it provides an opportunity for diverse outcomes across areas with different needs. However, the lack of any clear process, coupled with the tight timeframe to submit a devolution proposal, has also resulted in a degree of confusion among stakeholders. In addition, there is also a pervading sense that – despite a late shift to allow non-metropolitan areas to bid for powers – county devolution is less of a priority to the government than devolution to city-regions. Linked to this, there appears to be a lack of understanding in some parts of central government of the complexity that comes with devolution to counties and the limits of applying a city-centred approach to reforming their governance. Critics point out that there is currently a risk of incentivising an increasingly complex and fragmented system of public services and undermining functional economic areas if county deals and appropriate county governance do not form a substantial part of the devolution agenda. In this report, we will explore the ways that the current devolution process is playing out for county areas. We will look at the reasons why central government should devolve to such areas, and identify some of the reasons that make counties distinct from city-regions. We will draw upon case studies from five county areas that are in the process of developing innovative and creative models for governance that will enable their local councils and other public bodies to work better together, and our analysis will draw out some of the fundamental tensions that have emerged, as well as issues of process in the way that devolution bids have been handled by central government. In our final chapter, we will make a series of recommendations about how county devolution – indeed the devolution process generally – could be rolled out more effectively in the months and years ahead. Already the tide is beginning to turn. There are encouraging signs that the government is keen to see proposals for devolution submitted by counties and cities. Encouragement has come through symbolic gestures, such as the renaming of the cities devolution bill read out in the Queen’s speech to add ‘local government’ into the title, and the personal commitment of the prime minister (DCLG 2015b) and the communities and local government secretary (Paine 2015a) to county empowerment and devolution. But also, more importantly, it is being seen through substantial achievements such as the agreement of devolution deals for Cornwall and the North East, the flexibilities for the devolution of a wide range of functions to a broad range of governance models within the devolution bill, and the numerous county devolution offers which are being discussed with central government. Although there remain substantial concerns about how the process for devolution is being handled (see chapter 3), it is clear that there is a real opportunity for non-metropolitan areas to bid for increased powers to boost their economies and better serve their populations. In response to the challenge set by the government, many county areas have surpassed themselves in the development of serious proposals for devolution, which are now under discussion with central government. County government has a rich and unique history. It is the bedrock of local democracy dating back to as early as the seventh century and many historical counties are embedded as important entities within our collective cultural imagination – many people no doubt identify just as strongly to their county as others do to their home city. Counties account for 86 per cent of England’s landmass and represent half of the country’s population, 70 per cent of the country’s road infrastructure and 64 per cent of the country’s businesses (CCN 2015). Counties have a strong track record of delivering efficient and effective services, as demonstrated by their ability to acclimatise to the fiscal environment of austerity during the last parliament, and have consistently shown the ability and readiness to adapt to successive government agendas for public service reform. This chapter looks at some of the main reasons why county devolution is as important as devolution to the big cities and considers the complexities of implementing reformed governance arrangements. County economies make up a large proportion of the overall national economy. In 2012, counties as a whole made up 40 per cent of total GVA in England. Some counties contribute more to the national output, in terms of total GVA, than many Core Cities, and counties such as Surrey, Oxfordshire, and Cheshire and Warrington are among the highest-performing areas for GVA per head in the country (CCN 2014). In addition, counties have a strong claim to be the main hives of business and enterprise outside of London. The total number of active enterprises in county areas has grown to 1.03 million, higher than all other parts of England. Figures also show that in recent years there has been a significant increase (26 per cent) of new businesses in county areas, with counties only just behind London in the number of businesses created per 10,000 of population (CCN 2015b). County areas account for over half of the total employment nationally in manufacturing (53 per cent), motor trades and construction (both 52 per cent) (ONS 2015). Counties represent a distinctive offer in terms of economic opportunities for growth. The vast landmass and low population density of county areas provide vital locations for business ventures which need space, and the diverse geographies of counties, including those with multiple hubs, present the opportunity for mixed, resilient and healthy economies. Indeed recent research by DEFRA has shown that rural economies (which often make up a significant proportion of wider county economies) are some of the most resilient and innovative, and that they have a good mix of industry. This research shows that unlike other OECD countries, net migration in the UK is towards rural areas and that with the right support and empowerment rural productivity and growth could overtake urban (DEFRA 2014). Despite all of this, county economies face significant challenges. On average, productivity in counties is lower than that of all other sectors of local government including Core Cities (CCN 2015a). Counties have lower levels of wages and a high and increasing percentage of benefit claimants on ESA; they have large skills mismatches; and economic successes vary hugely across counties, with many performing below average (ibid). This, however, should be no disincentive for devolution given the size of counties’ combined economies arguably provides all the greater incentive for devolution deals to drive economic improvement as the prize is all the greater. Devolving significant new powers for economic development should help counties to address these issues and boost the national economy. In straitened times for local authorities, there is a pressing need to ensure that public spending is spent as efficiently as possible. The challenge is particularly acute in counties, due to specific demand-led pressures and more complex arrangements with service providers. Of particular concern is growing demand for social care services. Counties have on average 19.9 per cent over-65s, compared to 16.9 per cent for England as a whole and 13.3 per cent for the Core Cities (CAPPG 2015). In CCN’s recent submission to the spending review, the budgetary positions of adult social services in county authorities are described by 77 per cent of respondents as either ‘severe’ or ‘critical’ (CCN and Capita 2015). This situation could deteriorate further over the coming spending review period. In a CCN survey of council leaders, 87 per cent identified demographic pressures in adult social care as the area of greatest demand-led pressures in their authority. CCN estimates that its member councils and local providers are facing a funding shortfall in the region of £959 million for 2015/16 (CCN 2015b). There is also evidence that counties face bigger challenges beyond social care and right across their local health economies. Of the Challenged Health Economies, nine of the 11 are in counties (the other two are in London), and all three places on the Success Regime for Health are in counties. Given the pressures in health and social care, it is little surprise that health and social care integration should be a key part of devolution proposals. But beyond this, the geography and sheer complexity of the provider landscape in county areas also intensifies the need for devolution focus around public sector reform. CCN research has shown that counties are home to over 500 service providers and partnerships, compared to 87 in London. Counties, with multiple centres and large rural areas, may also experience additional costs for service delivery which aren’t wholly accounted for in funding allocations (LG Futures 2011). If the government intends to create the most effective and efficient economic and public service map of the country, then counties as strong, ambitious, well-defined places need to be empowered to evolve alongside city-regions. Historically counties have provided strong local accountability, with councils operating executive arrangements that allow local people to hold local politicians to account for the powers they currently exercise. However, a dramatic shift in decentralisation and devolved powers and budgets to local areas, as promised by the government, will force all local areas to strengthen existing accountability mechanisms and develop new models of governance that complement and build on counties’ heritage. Despite the strong track record on governance, individual counties have unique and complex geographies which offer particular challenges for devolution, not least in reforming their governance. County areas represent a diverse mix of urban, suburban, rural, deeply rural and coastal areas, and unlike many city-regions they often have multiple economic and cultural hubs with different offerings for business, communities and visitors. Counties are very different to second-tier city-regions in many ways, including their demographics, economies and geographies. This challenge is all the greater when considering existing governmental boundaries. Outside of metropolitan areas, there is much less coterminosity between the different boundaries for economic, social and cultural bodies. Many local enterprise partnerships (LEPs), for example, cover more than one county, and many clinical commissioning groups (CCGs) can overlap multiple areas. More broadly, decisions about major infrastructure will necessitate joint working at a regional level. Counties also have the added complexity of having to integrate vertically as well as horizontally. The city-region model sees a collection of unitary authorities formally coming together and agreeing new shared governance, decision-making and spending on particular issues. These authorities are usually of a similar constitution, operating in parity to one another in terms of their remit, responsibilities and budget. By contrast, functions in two-tier county areas are often split between district and county councils. District councils oversee local planning, environmental health, housing and waste collection, for example, while county councils are responsible for large-scale commissioning and service provision across social care, children’s services, infrastructure and transport. In addition, a combined authority may also include membership of single-tier unitary authorities as well. Overall, this means that different constituent authorities will have dissimilar experiences of the scale and types of commissioning and operations, and varying expertise to deliver devolved functions more effectively than Whitehall. While there are clear and demonstrable challenges in developing a joint offer and governance, there are also vital opportunities. The process of developing a proposal for devolution, and for rethinking structures of governance, is an opportunity to incentivise better working between multiple partners in county areas – and to allow them to assign powers to the most appropriate level for the needs of their populations. Anecdotal evidence from a number of counties suggests that two-tier working is strengthening and progressing substantially under the devolution agenda, in the interests of securing the best deal to serve and empower their area. This momentum should be incentivised and consolidated if the best results are to be achieved from devolution. In the following section we highlight some case studies of where this is now developing and provide recommendations to strengthen two-tier dealmaking. Despite the complexities concerning county devolution, the joint prize of economic development and public service reform has been enough to encourage no fewer than 22 county devolution proposals. One of these has already been agreed and to that extent sets a precedent for more. Signed in July 2015, the Cornwall deal was the first bespoke devolution agreement for a county area (the second being the North East Combined Authority, which includes the counties of Durham and Northumberland). It is also notable as the only area where a deal has been struck in this parliament without a mayor. Cornwall is a ‘unique case’ for devolution, and successfully argued that its existing strong (single) leader model met the government’s conditions for clear and accountable leadership. However, the agreement, as signed, also committed both parties to the ‘strengthening of local governance’ when further powers are negotiated, the suggestion being that any further deals may require a directly elected mayor. Cornwall represents a ‘unique case’ for devolution to a county area, not least because the economic and political geography is simple when compared to other areas. Cornwall is a unitary council, which operates the ‘strong leader and cabinet’ model, and enjoys near coterminous borders with the LEP and the CCG, both of which also cover the Isles of Scilly – the Council of the Isles of Scilly will opt into elements of the deal on a ‘theme by theme’ basis. Being a unitary authority means that the region can offer the clarity of leadership that two-tier areas arguably lack. Despite the fact that a wide range of powers was agreed for Cornwall, a number of key ‘asks’ set out in the original proposal have yet to be met, particularly around housing and planning (including the retention of an element of stamp duty and powers to control the number of second homes). One of the reasons behind this was the challenge of commencing and concluding negotiations on the deal in the short window between the general election and parliament’s summer recess. However, Cornwall has made it clear that the agreement is the first step in a longer process for more powers for the region. Senior figures in Cornwall remain adamant that a directly elected mayor would be an unnecessary addition to their existing system. The leader of the unitary council, it is argued, fulfils the government’s criteria for a single point of accountability. The existing Cornwall Public Sector Group (comprising senior representatives from public sector organisations and government agencies) already plays an important role in implementing long-term strategy and oversight of joint working. Nonetheless, the deal explicitly states that any further devolution of powers would be predicated on the ‘strengthening of local governance [… to] meet the Government’s ambition for visible and accountable leadership that enables residents to understand who is taking local decisions’ (HM Government 2015). Cornwall is now in the process of implementing the deal and (with eight separate themes involving an array of partner organisations) has established a multilayered system of governance, headed by a non-executive strategic monitoring board to oversee delivery. One of the key roles of the board is to identify and overcome obstacles that may impinge on the success of the implementation programme. Chaired by the council leader, the board also includes the deputy leader of the council, the chairmen of the CCG and LEP, the leader of the Council of the Isles of Scilly, as well as representation from Cornwall’s MPs. Cornwall’s proposal arguably succeeded because it made a clear and convincing case for the specific benefits of devolving certain powers and responsibilities to the local level. It also successfully persuaded the government that it could provide clear and accountable leadership. Key to this was the relative harmony between economic, social and cultural geographies. Inspired by Cornwall, other areas are putting forward their proposals for devolution. Most are pursuing a variant of a combined authority, which appears to be the government’s preferred option for governance at a regional level. For some areas, such as Cheshire and Warrington, this option is relatively straightforward. The proposal for Cheshire and Warrington covers three unitary authorities (Cheshire West and Chester, Cheshire East, and Warrington), which incorporate the Cheshire and Warrington LEP area. The three authorities already form an economic prosperity board and have strong working relations. Cheshire and Warrington is one of the most productive economies in the UK. Although there is no major metropolitan centre, the subregion contains several major economic hubs, including a large manufacturing and innovation hub based around Chester and the Mersey Dee, the high-performing economy of Warrington, and a major infrastructure hub based around Crewe linked to a potential future High Speed 2 station. In geographical terms, Cheshire and Warrington occupies an important position between Greater Manchester and Liverpool, as well as sharing a border with North Wales. A combined authority, it is argued, would allow for the region to speak with a ‘single voice’, in order to ‘hold its own’ in discussions with its neighbours.7 It also allows for increased joined-up and strategic thinking around infrastructure, skills, housing and public assets in particular. Cheshire and Warrington currently follows an economic prosperity board model of subregional governance. Under the devolution proposals submitted to the government the three constituent local authorities would look to establish a combined authority to make this a statutory arrangement. The combined authority would comprise two members of each local authority, including the leaders, plus the chair and deputy chair of the local enterprise partnership. At present, there are no plans to create a mayor for the combined authority. Given the small number of constituent authorities, it is argued that the governance structure would be simple enough without a mayor. Although working relations are good, the political make-up of Cheshire and Warrington is varied (Warrington is Labour-controlled, Cheshire East is strongly Conservative, and Cheshire West and Chester is a marginal Labour area, until recently Conservative), which may make the idea of a single elected leader a difficult proposition for councillors. Although the proposal includes asks around health and social care, there is no expressed desire for organisational or structural change (along the lines of devolution of health budgets in Greater Manchester). This might mean that a mayor is not seen as a ‘red line’ for central government, although there is a lack of clarity on where the ‘tipping point’ is. Feedback so far has been positive in terms of the proposals submitted. Detailed discussions have now started with the cities and local growth team to identify those aspects of the devolution proposal that could be developed sufficiently to enable headline terms to be announced in the autumn statement, with the further detail following in time for the budget in March. Cheshire and Warrington’s bid has been received favourably and conversations have started about what form a possible combined authority could take and what powers it might feasibly take on. There are no plans for an elected mayor, and it might be that local leaders are able to convince the government that one is not needed, given the simplicity of a combined authority of three unitary councils, as well as the relatively straightforward nature of current asks. Many other areas do not have it so easy. Important discussions are being held as to how best to develop a workable governance model that satisfies the needs of local partners, central government and the resident population. Hampshire and the Isle of Wight, for example, make the point that form should follow function as regards the design of any possible governance structure. The geography of Hampshire and the Isle of Wight (HIOW) is of significant scale and complexity. With a GVA of £47 billion, HIOW is close in scale to Wales and Greater Manchester, with nearly two million people and over 80,000 businesses. HIOW has a complex economic geography – substantial urban settlements, primarily in the south and north, contrast with large open areas interspersed with market towns and villages. In political terms, the area comprises a Conservative-led county council, three unitary authorities (one Conservative-led city, one Labour-led city and an Independent-led island), 11 district councils (predominantly Conservative led but with one Liberal Democrat) and two local enterprise partnerships. Prior to the general election, a proposal to establish a combined authority based around the two unitary authorities in the south of the county (with borders coterminous with the Solent LEP) was put forward by the leaders of Portsmouth and Southampton city councils. However, these plans were dropped in favour of a wider bid across HIOW that would create a larger economic entity, which respected the historic boundaries of the county of Hampshire. HIOW’s proposals for greater devolution of power from central government and its agencies are substantial and include a bold proposition to forego revenue support grant and other grants in exchange for the retention of 100 per cent business rates generated locally. HIOW could become the first area to retain 100 per cent business rates ahead of a national scheme. If this is pursued, HIOW local authorities will need to design and agree a local distribution mechanism with the right checks, balances and rewards. The chancellor has agreed the principle; it will be for HIOW to work through the detail locally. HIOW’s business rates proposition is the cornerstone of the HIOW bid, underpinning other key proposals. These include: the development of a business plan for accelerating integrated health and social care; accelerated housing delivery, plus delivery of an additional 500 homes per year in priority categories in return for commitments from the government on infrastructure and land release; and a locally led skills and training system that works for businesses and, in time, local commissioning and delivery of the Work Programme, or its successor. HIOW proposals for governance are being informed by the principle that form must follow function. As such, detailed design of HIOW’s governance arrangements will not take place until the content of a devolution deal has been agreed with the government and subject to a full governance review. The review will explore all options, including a combined authority with a directly elected mayor, as well as other forms of governance, such as committee governance and executive arrangements. The principle that form follows function has also led to a commitment to explore how some functions may be best delivered at a cross-combined authority level, or with multiple county areas outside of HIOW. For example, HIOW recognises the need to build on links already in place with Surrey, West and East Sussex, and Thames Valley authorities to address strategic transport considerations properly. In addition, the county council is working to identify and agree opportunities to delegate or devolve functions to district councils, parishes and community groups, in order to bring decision-making closer to communities and service users and deepen the benefits of devolution. Potential areas for ‘deeper’ devolution include management of local assets and community transport. In Hampshire, there is a lot of work to be done to identify a structure that meets the government’s demands for clear and accountable governance which works best across a large and complex county area. However, allowing form to follow function shows admirable commitment to proper process, and due respect for the delicate process of balancing the interests of all local and national stakeholders. Indeed, finding the most appropriate model is no easy task. In neighbouring Dorset, for example, differing possible models for governance have emerged, without a clear consensus yet on how to proceed. Dorset originally established the creation of a county combined authority as a preferred option, reflecting the view that the sub-region operates as a functioning economic area. Since then, leaders have suggested that a combined authority may act as a stepping stone to further local government reorganisation, including a possible unitary authority for the whole county. Internal negotiations in Dorset are a key part of ensuring better understanding of the priorities of different councils, as well as its particular geographies, politics and concerns that will shape its proposed model. But it is clear that the internal process requires a complicated balancing act. This may be one area in which the government is being overly restrictive. One such example, in Derbyshire and Nottinghamshire, represents a particularly creative attempt to balance the demands of central government for scale and accountability against the complexities of its local geography. However, as it stands, this initial approach has been rejected in favour of a model that more closely resembles a more straightforward combined authority, albeit across a wide, two-tier area. The two geographical counties of Derbyshire and Nottinghamshire are part of a single LEP area, strategically situated in the centre of the UK. Nineteen local authorities operate within the LEP geography: two county councils, two city unitaries and 15 districts. The scale and complexity of the vast physical geography (which includes the Peak District National Park), social complexities and economic clustering along the M1, A1, A46, A50, A61 and A628 corridors, as well as relationships with neighbouring city-region areas, such as West Midlands, Manchester and Sheffield, all provide challenges and opportunities. When the LEP was established in 2010, a pragmatic but essentially flawed decision was made to include only the two counties and two cities on its board. This has since been increased to include a district council representative from each county area. Nevertheless, the resultant democratic deficit was evident to the government, and the LEP’s Strategic Economic Plan, while judged to be positive overall, was deemed to be weak on governance. In order to address this problem, the 19 councils established two joint committees, one covering Derby, Derbyshire and the eight Derbyshire districts and the other covering Nottingham, Nottinghamshire and the seven Nottinghamshire districts. The aim was to move these forward to create two combined authorities working in a tripartite arrangement with the LEP. The aspiration for two combined authorities reflected traditional relationships and the geography of underpinning structures, such as business forums, skills provider networks and so on. Early discussions with the government on the proposal were encouraging and there was strong support from local business and the chamber of commerce. Public consultation confirmed high levels of support for the proposals and the combined authority submissions were made in early April 2015. The submissions mirrored each other and were built on strengthening relationships of trust and mutual support across the wider area. Meanwhile, early in 2015, through core city discussions involving Nottingham, the government opened the door for discussion on a potential core city LEP-wide devolution deal. The strong platform of joint working between the 19 local authorities enabled rapid progress to be made and a deal prospectus was submitted to government prior to the general election. In these ways, the prospect of a single devolution deal brought about a re-evaluation of governance and a growing preparedness to ‘think bigger’. The other catalyst for a change of perspective has been the emerging construct of the Midlands ‘Engine for Growth’, first mentioned by the chancellor in a speech in Derby in June. The Midlands is a vast area stretching from Wales to the North Sea and from the home counties to the northern powerhouse. In the days of regional government, the East Midlands was the Cinderella region, never as well funded per capita and never given the recognition it deserves for its export-driven, manufacturing economy. The Midlands ‘Engine’ is gathering momentum and Derbyshire and Nottinghamshire are strategically placed to take advantage, being the location that links the engine to the powerhouse. The devolution asks are based on the drivers of economic growth: jobs and skills, enterprise, transport, housing, and smart infrastructure. There is also a readiness to take on broader public service reform. Crucially, the devolution bid is well balanced and reflects the whole geography, both urban and rural. It is based on four themes: metro areas, market towns, rural isolation, and regeneration of former coalfield and industrial areas. At the time of writing, negotiations are well underway with the Treasury. If the deal is brokered it will stand alongside the deals reached in Manchester, Sheffield and the North East and will be the first mayoral deal in two-tier counties. Elsewhere, other areas have acted on their own initiative to pursue local need – such as Suffolk, where the focus has been explicitly on public service reform. 11Suffolk has shown a clear and compelling ambition for changing the way that its resident population is served by public services. In effect, it represents a ‘one public service’ approach, where agreed principles and ways of working can overcome complex structures and governance to coordinate activity at a local level. It is increasingly likely that Suffolk will join with Norfolk to bid for devolved powers; however, local leaders will be keen to ensure that the focus on public service reform is not lost. Overall, the five case studies explored in this report illustrate the point that while the benefits might be great, reforming county governance is not straightforward: there are specific issues, often related to the interplay of different geographies, that are particular to counties rather than city-regions and to that extent the government needs to show greater flexibility than currently appears to be the case. In chapter 3 we explore some of the more fundamental tensions and process challenges that stand out from our case study areas. 4 See for example, the devolution deals agreed for Greater Manchester and Cornwall. Several county areas have also had feedback to their proposals encouraging a focus on public service reform as well as economic growth. 5 Joining up budgets and teams at the local level, with a single point of contact for users, can transform people’s experience of services and make more efficient use of resources (McNeil and Hunter 2015) and deliver cost-savings. Evaluation of community budget pilots showed that if all places adopted the approaches on health and social care, troubled families, and work and skills, there is the potential for better services and savings of between £9.4 billion and £20.6 billion over five years (Local Government Innovation Taskforce 2014). 6 This includes powers to franchise bus services and an agreement between central and local government to work with NHS England to develop a business plan for the progressive integration of health and social care. Other areas include Cornwall and the Isles of Scilly being given Intermediate Body status for EU funds and the creation of a single public estate strategic board. 7 The important economic hub in the Mersey Dee region straddles Merseyside, Cheshire and North Wales, necessitating clear channels for cross-border communication. It is intended that a single combined authority would be able to work more closely with the North Wales Economic Ambition Board and Liverpool city-region. Sensing the momentum behind the government’s devolution agenda, many counties have enthusiastically embraced the opportunity to bid for devolved powers from central government. But this is uncharted waters for many, including central government. The Cities and Local Government Devolution Bill allows for the devolution of any public function, and the wide variety of ‘asks’ that have already been submitted shows that local areas are prepared to think very creatively about what would best suit their area. While this is to be applauded, questions remain about how devolution is being handled at present. Negotiations and discussions between local and central government have revealed several issues regarding how the process is being handled by the government. In this chapter, we look at some of the process issues thrown up by the current government approach before exploring some of the more fundamental tensions brought about by the lack of any guiding principles or framework of approach. Discussions with stakeholders, including representatives from each of our case study areas, have identified significant problems with the way that the devolution dealmaking process is being conducted. Overall, the negotiation process around deals has been opaque, with different areas being asked to engage in different ways and often conflicting and changing messages coming from central government to county areas. At times, it seems that there are clearly ‘unwritten rules’ for devolution deals, but while the government will not allow progress beyond certain points it is often unclear why, and these obstacles often appear to shift. Such a negotiation process is particularly difficult for county areas, as there seems to be more uncertainty around what is expected of counties and less surety that substantial devolution is achievable. It is also difficult due to the volume of partners with diverse views involved in county negotiations, many of whom need to keep their executives, their non-executives and their scrutiny functions on board with the process. Although the government made it clear that proposals from county areas would be considered after the 4 September deadline (Paine 2015a), many understood the importance of being ‘first in the queue’, not least because any significant transfer of powers would need to be linked to the spending review as devolution required changing the way departments worked. Some of those in local and central government, and beyond, were appreciative of the tight timeframe, suggesting that it made it easier to build momentum and focus the attention of local stakeholders, including politicians. But it may have also affected the quality of some deals, as plans are put together quickly and with scant regard to due process. The Centre for Public Scrutiny has warned that failing to give governance and scrutiny arrangements full thought, and scrutiny committee members early sight of proposals, could mean elements of devolution deals might not be implemented as envisaged or deliver what has been promised (CfPS 2015). In addition, time is needed to build trust and develop working relationships between partners, which is of particular importance in some county areas, in particular those who are looking to work across multiple county areas. Another key point is in regard to limited capacity in Whitehall. Councils have noted that many departments appear to lack sufficient capacity to allow them to work closely with each area in the development of their deal (see LGA 2015). Many stakeholders were positive about their experience dealing with many governmental departments. It was suggested that the Treasury’s driving force behind the devolution agenda had helped open up conversations over key powers, and that many departments understood the particular circumstances of county areas. In particular, staff at the cross-departmental Cities and Local Growth Unit and Department for Communities and Local Government were singled out for particular praise for their knowledge and understanding, and for their willingness to engage with and support local stakeholders throughout the ongoing process. Elsewhere, however, different departments have shown varying degrees of willingness to come to the negotiating table,8 and councils report having to engage bilaterally with different councils, often having to remake their case for devolution and re-tread arguments that have already been played out elsewhere. Added to this, there was also a sense that the Treasury often holds the trump card. Even if councils can persuade other departments of their case for action, it is ultimately Treasury officials who have the final say on all matters. Finally, there is also a risk that some departments may try to row back on headline commitments made in devolution deals once the Treasury and the government’s focus is elsewhere. Those devolution deals agreed so far have been very broad, with details to be fleshed out in successive discussions between all partners. In part, this is a natural part of any agreement of this kind; however, there is currently no mechanism for holding departments to their commitments, raising the prospect that Whitehall’s innate centralising tendency may produce far less radical outcomes than promised in the original wording of particular deals. It is also particularly concerning in view of the forthcoming spending review where there is a risk that hasty decisions now might have unintended consequences into the long term. More broadly, and despite public assurances from the government to the contrary there is anecdotal evidence that city devolution bids are given prioritisation over county bids within central government, particularly by the Treasury. The worry is that limited capacity within Whitehall will inevitably lead to the ‘big ticket’ metropolitan deals being prioritised, with full support of the Treasury to push for an ambitious settlement, while other areas will be left to catch up at a later date, with less momentum behind them. Coupled with the seemingly inflexible and unspecific approach the government is taking to county governance this presents a risk that a two-class system will be created, with county economies left disempowered and communities left disenfranchised. In a world where local government finance would appear to be tied increasingly to business rates and economic growth this is even more important. Adding further disparity to this systemic problem will be the government’s stipulation that only elected mayors may raise business rates for infrastructure projects – effectively capping and controlling non-mayoralties. If cities are seen as the only game in town, then this risks fragmenting other economic areas which are currently strong and functioning, such as county economies. If parts of counties look towards cities as the only means of driving local priorities this also begins to add confusion, complexity and fragmentation to the local government and public sector map and puts strain on the two-tier system. Beyond problems with the dealmaking process, the lack of any government guidance has also allowed a number of important tensions to surface. Before the election, much of the focus of debates around devolution and decentralisation was on local economic growth and infrastructure. The city deals programme, for example, was explicitly designed to give local areas specific powers and freedoms to help the region support economic growth, create jobs or invest in local projects. Likewise, the chancellor’s ‘northern powerhouse’ project has ostensibly been framed around making the collective economy of the north more competitive and productive. This focus on economic development was arguably sustained during the first stages of the current devolution process. In his first speech following the election, the chancellor indicated that the government would be extending a form of the city deals programme to cover counties and towns – whereas cities would be allowed to bid for wider powers over healthcare and housing, as well as skills and transport (HM Treasury 2015a). However, the devolution of health budgets to Greater Manchester, together with the agreement in Cornwall to work towards the integration of health and social care, as well as successful lobbying for parity of treatment from the government between county and city-regions (see DCN and CCN 2015) have persuaded some county areas to bid for health powers. A total of 10 bids were submitted from non-metropolitan areas seeking control of health budgets, compared to just three from city-regions (Paine 2015b).9 This is clearly a reflection of the uniqueness of county areas described in chapter 2, specifically the need to tackle unsustainable demands on health and social care and rationalise a more complex and fragmented public service landscape. At present, it is unclear how favourable these asks will be received in Whitehall. There is some suggestion that the Treasury will prioritise a handful of bids, the majority of which will be from city-regions, ostensibly putting the ‘big ticket’ option of health devolution out of reach for most. Where health and public services are included in a bid, tensions emerge between competing geographies. While some areas may wish to submit governance proposals that reflect county boundaries (such as Suffolk’s original proposal), doing so may not correspond to a sizeable functional economic area. Conversely, where it may make sense to operate at a wider, intercounty, level in some policy areas – such as transport and infrastructure – it may not make sense to function at this geography for public services. This issue, of different health/economic geographies, is a particular issue in counties (Localis 2015). In a similar vein, the need to work at scale for purposes of economic development may conflict with other more ‘natural geographies’ where economic geographies do not align with cultural and historical landscapes in the public imagination. The government seems to see LEP geography as a minimum area for a combined authority to operate. In general this is a good principle, although it immediately encounters issues in areas with overlapping LEPs or where counties are smaller than their functional economic areas. Having an elected mayor could exacerbate this tension: the identity of a mayor of a multicounty region could be divisive if half the population see themselves governed by someone from outside their county. And turnout rates for mayoral elections are arguably likely to be much lower for a LEP-wide geography which signifies little in the public imagination. Delivering a new relationship between central government and county areas will mean ensuring subsidiarity and double devolution in two-tier areas. Many counties believe in double devolution and subsidiarity where powers reside at the lowest appropriate level. In order to achieve this, first this means substantial devolution of powers and funding from Whitehall to county areas and regions. County and districts could then, as part of local deals, negotiate where specific powers and service delivery should sit. CCN research shows a strong commitment to ‘double devolution’ to district and parish council level, with counties already devolving and seeking to do more as powers are drawn down from central government (CCN 2014). It is clear that for devolution to drive economic growth and transform public services, county and county unitary authorities have the key strategic and leadership role, which will mean specific strategic responsibilities being pooled at a county or combined authority level. Devolution deals should also exploit the existing strengths, expertise and economies of scale of county and district authorities: for instance, health and social care, skills, apprenticeships, transport, and infrastructure at a county level, and the locality work of district councils on planning, housing, business support, and community safety. However, solutions should not be imposed and local areas should be able to design their own arrangements to best meet their local needs, with powers presiding at the most appropriate level. One of the biggest criticisms of the current push for devolution is that is has privileged dealmaking over democracy. At worst, the current push for devolution is little more than a transfer of powers between a national and a local political elite. More generously, the process is encouraging expedient decision-making without getting bogged down in lengthy consultation processes which can often stifle energy and momentum. A key advantage of reforming county governance is to allow greater communication with other partners, including LEPs, health bodies and police. However, this emphasis on joint working inevitably requires careful work to ensure transparency and accountability is maintained. The government placed high importance on the involvement of the LEP in any devolution process. In June 2015, communities secretary Greg Clark confirmed that no devolution deal would be workable unless LEPs were ‘at the heart’ of proposals (Paine 2015c). As well as including the LEP as a signatory to their proposals, many areas have committed to closer working to include enhanced input from the LEP on economic matters, including some proposals such as Cheshire and Warrington that have included a LEP representative on the combined authority board. But the problem many see in this is that LEPs are not democratic bodies and few even allow for a formal process of business representation. Sharing decision-making powers requires clear accountability and scrutiny processes. These will need careful work to ensure the legitimacy of any agreed governance arrangement, as well as its effectiveness. The government has made clear that, for metropolitan areas at least, it views an elected mayor as a prerequisite condition for devolution of major powers (HM Treasury 2015a). Supporters point to the success of mayoral models in major cities overseas, although it is worth noting that there are fewer examples of direct election at the city-region level than some would expect.10 And there are even fewer precedents for a directly elected executive mayor in non-metropolitan areas. In its current form, the Cities and Local Government Devolution Bill enables the creation of a directly elected mayor for a combined authority. A mayor would be a member of a combined authority, and would be its chair. They would be elected by the public through a system of supplementary voting,11 and would therefore have a direct mandate to govern, as opposed to other members of the combined authority, who would be appointed representatives. But it is important to note and consider that the Cities and Local Government Devolution Bill is only unique in enabling the creation of directly elected mayors for a combined authority: the Local Government Act 2000 introduced new executive governance arrangements for local authorities, including the elected mayor and cabinet model. It was through this Act that a range of local authorities adopted this executive arrangement following local referendums, including a number of Core Cities, London boroughs and district councils. Following the 2010 general election a further 11 cities were offered the opportunity to adopt an elected mayor with the promise of devolved powers. This opportunity was rejected by all but two city areas. The main justification for the combined authority mayoral model, and previous attempts to encourage local authorities to adopt the mayor and cabinet executive, is greater accountability for public decisions. Having a directly elected figurehead, it is argued, allows the population a clear influence over the policies of a combined authority or local authority, that otherwise would be lacking from an appointed cabinet model which would be made up of representatives from its constituent members. The 2012 consultation on granting city mayors additional powers stated that: ‘Mayors provide visible leadership experiencing greater recognition among local people when compared to other local political leaders and therefore it is clear where the buck stops’ (DCLG 2011). The CfPS has laid out three core principles for governance: namely, mechanisms to ensure executives are held to account for decisions that are made; transparency on how choices are made; and a commitment to public involvement (such that decisions are informed by the views and concerns of the public) (CfPS 2014). It could be argued that a mayor would improve the way that the public is involved in decision-making. Arguably, a directly elected mayor fulfils these criteria more easily than an indirectly elected leader. The advantages of an elected mayor are argued to be greater visibility, accountability and coordinative leadership, much of which stems from their relative independence from party politics (Warwick Commission 2012). Likewise, a single mayoral figure has the potential to foster more decisive action on strategic issues, to act as a representative to local business and central government, bring coherence to the actions of the public sector, and collaborate with local authorities, business and other players in the wider local economy (IG/CC 2011). Increasingly, it appears that those areas that accept the government’s arguments around ‘accountable and visible leadership’, and that opt to accept a combined authority and directly elected mayor, are more likely to receive the substantial powers they want (Localis 2015). Recently, there has been some indication that the government would only transfer ‘major powers’ to areas that adopt a directly elected executive mayor along the combined authority model (Geater 2015), although there is a lack of clarity on the point at which a mayor would be a requisite condition for devolution. This could mean that modest bids, such as that from Cheshire and Warrington, may proceed without the need for an elected mayor; however, other areas with more ambitious plans are unlikely to get many of their asks without some concession on this point. In discussions about whether or not a mayor is appropriate, however, there is little further detail on the different forms a mayor could take, and the extent to which they would be free to wield executive powers. Under the combined authority metro-mayoral model, having a mayor would currently entitle a combined authority to take on wider powers. At the Conservative party conference, the chancellor announced that local governments will be able to retain all local revenue from business rates. However, only combined authorities with an elected mayor will have the power to increase local business rates (HM Treasury 2015b). Also, only mayoral combined authorities may be made a major precepting authority for the purposes of local government finance, allowing them to levy funds from constituent local authorities to enable them to perform their functions. Finally, the chancellor has indicated that a city-region would need an elected mayor if it wanted a devolved health and social care budget as proposed for Greater Manchester. In theory at least, a mayor could take on a very wide range of local government powers under the Cities and Local Government Devolution Bill. Under proposed legislation, a combined authority may take on any function of its constituent local authorities, subject to their consent. Any of these powers may be invested in the elected mayor. In addition, a mayor would be able to assume the function of the police and crime commissioner for the local area. Many counties do not believe that a combined authority metro-mayor would be suitable for their area, with over 80 per cent of leaders responding to a recent survey that the model would be quite or very inappropriate to their area (CCN 2015).However, adopting a mayor and cabinet executive arrangement could provide the type of electoral mandate and single point of accountability demanded by the government if this continues to be a precondition for substantial devolved powers. Importantly, it could also avoid the creation of additional layers of governance in already complex county areas and even build on existing governance arrangements, including health and wellbeing boards and area committees. The previous attempt to install elected mayors across 11 cities in 2012 was accompanied by a consultation on devolving new powers across rail and bus services, skills, apprenticeships and infrastructure directly to city authorities, not combined authorities. In the case of a single upper-tier county council seeking new powers over skills, infrastructure, transport, health and social care, the extension of the same rationale could provide a viable route for negotiation. This is particularly important at the current stage of the devolution debate. There is an expectation that as part of business rates reform, the government will expect local authorities to take on a range of new duties relating to economic growth, many of which we would expect to align with the responsibilities of an upper-tier council such as infrastructure, skills and transport. The clear block on progressing Coalition plans to devolve directly to elected mayors during the last parliament was public referendums. The government, in seeking to introduce directly elected combined authority mayors, has taken the position on their being no need for local referendums, seemingly learning from previous experiences. It is therefore important to note that despite the referendums that took place in 2012, under section 9 of the 2000 Act, amended by the Localism Act 2011, a local authority in England can introduce an elected mayor and cabinet model without a referendum unless its current form of governance was decided following a referendum. This means for counties in England, none of which have attempted to adopt this executive arrangement, a referendum would not be needed to introduce this model. During the committee stage debate on the Cities and Local Government Devolution Bill, CLG under secretary James Wharton indicated that the government regarded local authority mayors as taking ‘powers up and away from people’ while metro-mayors take powers ‘down towards people and away from central government’ (HoC 2015). This position seemingly contradicts the Conservative-led policy position of the Coalition government with regards to the adoption of city mayors in 2012. However, with business rates reform on the horizon and the need for all areas to have robust governance and accountability mechanisms in place to exercise expected new powers, the government should be open to exploring the full range of options, particularly when it is demanding local areas meet criteria such as single points of accountability. In summary, while there may be clear advantages of directly elected mayors in city-regions, those same advantages are not as immediately clear for counties. The lack of a clear urban centre, the more complex geographies and identities that counties often encompass, and the multi-tiered governance that already exists all suggest that more creative approaches to enhancing county governance might offer better routes to transparency, accountability and public engagement. 8 In particular, reportedly little progress has been made to persuade the Department for Work and Pensions (DWP), the Department for Environment, Food & Rural Affairs (DEFRA) and the Home Office to discuss what could be devolved to local areas. 9 Bids asking for health powers were received from Cumbria; Heart of the South West (Devon, Somerset, Plymouth, and Torbay); Gloucestershire; Greater London; Greater Manchester; Hampshire and Isle of Wight; Lincolnshire; Liverpool city-region; Norfolk; North Yorkshire; Oxfordshire; Suffolk; and Surrey and Sussex. 10 Alternative models include leaders’ boards with a delegated city-region ‘president’ (Bologna) or a fixed-term, rotating chair; elected and unelected ‘assemblies’ (Rotterdam); and ‘standing conferences’ of key stakeholders who are responsible for a city-region strategy and plan (Barcelona). 12 Greater Manchester’s arrangements, which are broadly reflective of those in Sheffield as well, could be seen as giving the local leaders – not the mayor – the whip hand on most matters. On issues where they have executive powers – including transport, housing and policing – the mayor can be overturned on any decision if two-thirds of the cabinet choose to reject their plans. They will also require unanimous support of all 10 leaders to develop the strategic housing and planning that will help to guide investment and development. On matters beyond their direct remit – including health, social care and other public services – the mayor will be an ‘eleventh member’ of the combined authority board, with a single vote. In this report we have identified the significant progress that the government is making with its devolutionary agenda in England. The permissive nature of the Cities and Local Government Devolution Bill is to be welcomed and the government is right to argue that each devolution deal must be specific to the area with which it is negotiated. This is bringing significant benefits to those city-regions where deals have already been negotiated and agreed. Our report has also highlighted the fact that a significant number of counties have submitted their own plans for devolution. Indeed, such is their enthusiasm for change that 22 out of 38 devolution proposals made in the run-up to the 4 September deadline came from county areas. As the case studies in this report demonstrate, the large majority of these proposals are worthy of serious consideration. County devolution promises some significant benefits both in terms of economic growth and public service reform, however, until now, it is only Cornwall and, more recently, the North East Combined Authority – which includes the counties of Durham and Northumberland – that have secured a devolution deal. Devolving to counties has raised some serious questions. It is increasingly felt that county devolution is less of a priority to the government than devolution to city-regions. Furthermore, it would seem that the complexity that comes with devolution to counties highlights some problems and tensions with the current ‘city-centred’ approach: whether the narrative and purpose of devolution is to achieve economic growth or public service reform; what geographical ‘scale’ is most appropriate for devolving different powers; and the extent to which different models of governance can be best applied to very different institutional landscapes. In this final chapter, we attempt to clarify some of these issues and suggest a way forward that supports the government’s broadly enabling approach, but at the same time provides a greater level of rigour and clarity for devo dealmaking – promoting an equality of process even if not outcome. In our previous report, Decentralisation decade (Cox et al 2014), we identified five principles which we argued should underpin any programme of decentralisation in England. Decentralisation must be for a broad and clear purpose – with some clear, long-term goals and outcomes. Decentralisation must be joined up requiring a coherent and coordinated approach across government. Decentralisation will necessarily be asymmetrical as the appetite and capacity for devolution will vary from place to place and the arrangements themselves will vary according to local context. Decentralisation will take time, not least for the necessary adaptations to take place – both centrally and locally – and for new capacities and skills to develop. With the exception of asymmetry, to date, the government’s approach has not given sufficient consideration of these other principles. And even in the case of the asymmetrical approach, as chapter 3 showed, there is a growing sense that negotiations owe more to departmental arbitration than to any clear sense of a genuine appreciation of local difference. Indeed, too often it seems that the government is working to a set of hidden rules. To this end, we return to our principles of decentralisation and propose some more detailed suggestions pertaining to the immediate context and to county devolution in particular. Recommendation 1: The primary narrative of county devolution deals should be to drive economic development, and in the short-term deliver the government’s agenda associated with local growth. Public sector reform, particularly health and social care integration, should remain a central pillar of county devolution deals. However, it should be acknowledged that this will be dealt with over a longer time period once initial arrangements start to bed in and governance capacities grow. Following on from recommendation 1, the government must be more explicit about the geographical scale around which it would prefer to see county proposals. If it is the case that the government is normally seeking county deals that are coterminous with local enterprise partnership areas then it should be explicit about this. In this context, the government should also make it possible to allow for the rationalisation of LEP boundaries where there is local demand to do so. If not, then it should clarify the situations in which it is prepared to accept divergence. It is increasingly clear that although the Cities and Local Government Devolution Bill is open and permissive about the governance arrangements associated with further devolution, in fact the government is closely wedded to the idea of directly elected mayors for anything other than very modest devolutionary proposals.13 It also seems to prefer large-scale combined authorities, coterminous with LEP areas. There is a clear contradiction in this position, especially given the demonstrable complexity associated with county devolution arrangements and the creativity with which local partners have approached new governance solutions. If the government will not accept multiple combined authorities within a single deal then it should say so. If it is the case that there are ‘asks’ that are considered out of scope for combined authorities who do not wish to have a directly elected mayor then these should be made explicit. If it is the case that the government thinks that directly elected mayors can give adequate expression to the governance of the complex political geographies of counties – as well as cities – then again it should say so. Equally, counties need to recognise that significantly increasing local powers are necessarily conditional upon higher levels of visibility and accountability of decision-makers – maintaining the status quo is not an option. We have shown in chapter 3 that central government is facing a difficult task in the way that it responds to the number and sophistication of the devolution proposals that have already been made and the prospect of further proposals to come. This is not only an issue of capacity and the bottleneck caused by the 4 September deadline. The process by which deals are being negotiated is highly convoluted with different government departments adopting very different stances towards the demands being made of them and their readiness to pass powers down. Added to this while the Department for Communities and Local Government is playing a commendable role in relation to the coordination of the devolution process, it would appear that ultimately the Treasury has the final say regarding all matters, including governance. The process by which devolution has taken place since the general election has moved at a rapid pace, not least with the milestone set for the submission of proposals by 4 September 2015. While this has been an important device to generate momentum and drive, it has not taken sufficient account of the importance of three core aspects: building trust between individuals and institutions; negotiating important details of future arrangements; and ensuring public buy-in. This has affected local relations, but it is also apparent that it has created significant difficulties within central government too. Above all, it does not make for good dealmaking as reasoned discussion and the sharing of good practice is sacrificed in favour of achieving rushed deadlines. Recommendation 14: The government should work with other national bodies to do more to encourage collaboration between areas in order to enhance deals and drive up good practice. It is in view of improving good practice in developing devolution deals that the final section of this report highlights some of the particular issues in this regard. In chapter 3 we showed how there is a tension between the government’s desire to maintain an open and permissive approach to negotiating bespoke deals that are unique to the local context and being able to apply key principles or guidelines which might help negotiation and support good practice. Although it may not be by design, there is a perception that the secrecy around the devolution process and individual negotiations may lead to the discouragement of collaboration between areas and is not a constructive way of striking deals across all parts of England and sharing best practice. While there is no intention here of undermining the importance of a case-by-case approach to striking devolution deals, we do think there is considerable merit in mutual learning and collaboration between areas and to this extent we set out in the following section a number of general ‘models’ which – notwithstanding our concerns about the government’s genuine commitment to diversity cited above – might form the basis for counties to consider the types of governance that might support their differing geographies and their diverse devolutionary demands. At present, the combined authority is the government’s preferred option for governance at a subregional level. A combined authority consists of two or more local authorities, and in non-metropolitan areas this may include county, district and unitary partners. The membership and functions of the combined authority are to be specified in the order setting it up. The orders made so far have specified that each constituent authority is to appoint one elected councillor to be a member of the combined authority. In all cases so far, decision-making is made on the basis of one-member one-vote. This model enables collective local action on issues that reach beyond the confines of a specific local authority. With the Cities and Local Government Devolution Bill, the government is significantly expanding the remit of combined authorities to allow them to hold a broad range of powers (beyond economic development, regeneration and transport), to remove certain limitations on their geography, and to permit non-local government decision-makers to sit on a decision-making board as non-constituent members. Accountability is a key issue. As constituent members of a Combined Authority are appointed, the public lacks a mechanism to hold them directly to account (although the public do have a role in electing them at ward level). The government’s preferred mechanism appears to be a directly elected mayor; however, many county areas are sceptical about the utility of this model in non-metropolitan areas for the reasons outlined in this report. Beyond a directly elected mayor there may be other ways for a county combined authority to achieve some of the requirements central government are looking for in strong local leadership. There is flexibility for the local area to design different models for chairmanship of the combined authority, and this may include putting a ‘strong’ model of CA leadership in place. Such a model could ensure that functions are in place to make the leader visible to the public and put in place strong channels of engagement and communications between the leader, public and other partners. The designing of resources to such a leader could ensure that they are able to take a strategic approach and deliver on the area’s priorities. Finally we suggest that the setting of voting systems within the CA and the length of terms for the leadership should allow enough time for the leader to deliver tangible outcomes, and be held accountable for these outcomes – a rotating chairmanship between members may dilute this mandate. A combined authority in a non-metropolitan area arguably works best where there is some sense of regional identity for the whole area, and where governmental boundaries (such as county area, LEP boundaries) are coterminous. The complexity of county areas, including the existence of two-tier local government, presents a real issue in addressing a key governance demand of central government: single points of accountability. 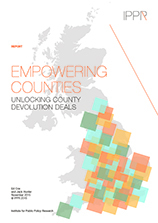 In the context of the uniqueness and specific challenges facing counties, we believe the models presented in this report do provide sufficient governance solutions for county areas for the majority of powers and budgets being explored as part of local deals. However, the government may continue to contend that in devolving substantial new powers over economic growth, health and public service reform, county areas require a single point of accountability, similar to that offered by the elected mayoral route. For devolution deals spanning multiple counties or unitary authorities where an elected mayor is not seen as appropriate, local areas could look to explore the strong combined authority or public service board leadership, building on their strong local mandates and partnership working. But for those seeking deals spanning a single unitary authority or single two-tier county, there is scope for exploring whether powers to directly elect a ‘county mayor’ without the need for a combined authority can provide both collective leadership for partners and a single point of accountability currently being sought by the government. A mayor and cabinet executive arrangement at a county level could provide the type of mandate and single point of accountability demanded by the government as a precondition for substantial devolved powers. In the case of a single upper county council seeking new powers over skills, infrastructure, transport, health and social care this could provide a viable route for negotiation. If a county was to pursue this model, it should seek to do so by consensus with its partners, particularly district councils. Led by the upper-tier council, local partners can put in place governance arrangements around the single point of accountability provided by the elected mayor, with districts incentivised through a more formal role in the county decision-making process and strong ‘double devolution’ offer to join joint committees to pool additional powers, develop localised delivery and hold the elected county leader to account. It also has the advantage of building on existing health and wellbeing board structures for the exercise of any new powers of health and social care, negotiated as part of a new devolution settlement with central government. Partnerships involving local public bodies (such as local authorities, health and wellbeing boards and the police) are a significant feature of public service delivery. A public service board allows for strategic decision-making across public services in a county area. It would include senior representatives from key public services, including the leaders of all relevant local authorities, on a single board, who would jointly come up with a service strategy and investment plan. This reflects a ‘one public service’ approach where agreed principles and ways of working can overcome complex structures and governance. There are clear advantages to working across organisational boundaries to focus on integrated solutions to shared problems; however arrangements must clearly define how it will be set up, in order to avoid generating confusion about decision making and commissioning between elected local authority members and other public authority officials. There may also be considerations around scale: arguably it makes most sense to align public sector leadership at the county level, whereas decisions on economic development may be best made on a larger, LEP-wide geography. A federated model would involve a partnership between multiple combined authorities, each of which would retain separate legal status and their own budget allocations. It allows for powers and functions to be devolved to a wider area (such as a LEP area that covers multiple county areas), while retaining the distinctive identities of its constituent members. This model may be useful where economic, social and political geographies do not align – for example where two county areas sit within a single LEP region. By respecting historic county boundaries, it allows for a greater ‘sense of place’. Although formal statutory powers would be sited within each combined authority, collaborative working could be supported through an informal forum of executive leaders, as well as shared resources, including officers, between each constituent member. The federated model also offers one solution for aligning work between neighbouring combined authorities, such as between city and counties, in order to create larger governance structures that span larger areas for appropriate functions such as infrastructure planning. Unitary authorities arguably have a head-start over others in their governance arrangements. Indeed, one of the reasons why Cornwall was the first county to agree a devolution deal with central government was because it has already achieved the appropriate geographic footprint to take on devolved powers through earlier reorganisation – which was a key point of Cornwall’s 2007 unitary bid. A unitary authority offers simplified and streamlined governance arrangements through a single council and cabinet. It also includes a single point of accountability, in the form of an appointed leader. The experience of Cornwall suggests that some unitary authorities may be able to achieve a modest devolution deal without the need for radical change to their structures, although more radical asks may require changes, in order to satisfy the government’s criteria for clear and visible accountability. If a unitary authority seeks greater control over health spending, for example, then changes would be made to governance, such as the creation of a formal partnership between leading representatives from the council and relevant health bodies. Likewise, the government appears to be more likely to devolve significant powers if a unitary authority is prepared to accept a directly elected mayor. In the past few months, the devolution genie has well and truly escaped the lamp. This presents a huge opportunity for cities and counties alike, but unless the government moves quickly to recognise the importance of county devolution – and the added complexities that this brings – and unless it demonstrates a greater willingness to adhere to its principle of negotiating locally specific deals, then it risks causing little more than irritation and dissent. With some simple steps to clarify its purpose and principles and to spell out a more coherent process for negotiation, the government could quite easily set the process back on track. If it does not address these issues, then its well-intentioned plans could be undermined by frustration and lack of trust. 13 That Cornwall managed to sign a significant deal is partly testament to their foresight and preparedness, but other areas that lack the simplicity of a unitary structure and a relatively straightforward local geography are highly unlikely to achieve something similar – as many stakeholders have stressed to us, Cornwall was a unique case for devolution. District Councils Network [DCN] (2015) District Councils’ Network Submission to the APPG for Reform, Decentralisation and Devolution in the UK.